A number of variables can potentially affect the outcome of your personal injury case. This includes whether or not you're in the middle of divorce or contemplating separating from your spouse. If your ex is angry, he might provide testimony that makes you seem untrustworthy. This could cast doubt on whether your injuries are the result of the accident or make it seem that you're exaggerating symptoms to receive a higher settlement. Casting doubt on your credibility can make it more difficult to prove negligence and causation, two elements that are vital to winning your case. If you think there is a possibility your ex might provide unfavorable testimony, your attorney will need to gather ample evidence to support your claim for damages. This might include talking to medical experts familiar with the injuries you've suffered or vocational experts who can testify as to how the effects of your injury are likely to influence your ability to continue working. Keeping a detailed journal documenting your recovery and taking photographs of any injuries as they heal may also be a way to counter the effect of any potentially negative testimony from a disgruntled ex. It’s possible you may be required to split your personal injury settlement if it's received after you file for divorce. Laws regarding the division of property vary from state to state. Arizona, California, Idaho, Louisiana, New Mexico, Nevada, Texas, Washington, and Wisconsin are known as community property states. 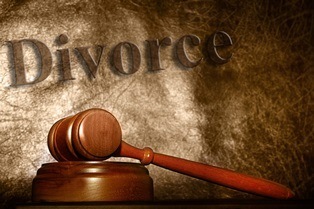 Louisiana divorce law considers assets to be either separate property or community property. Separate property belongs to one spouse, while community property belongs to both spouses. Common examples of separate property include assets acquired before marriage and assets received as a gift or inheritance. Community property generally encompasses the majority of assets acquired during marriage, including wages and items purchased with the earnings or one or both spouses. However, separate property can become community property if assets are commingled. For example, using an inheritance to buy a home that you both live in and help maintain turns the asset into community property. A personal injury settlement can be considered either separate property or community property, depending on what damages are being reimbursed. For example, pain and suffering damages would be the property of the person who was injured, but loss of consortium damages would belong to the spouse. Compensation for lost wages would likely be considered community property. Generally, community property is divided so that each spouse receives an equal share. If you have a valid prenuptial agreement, however, the court may decide it is appropriate to allow an uneven distribution of assets considered community property. This could include a portion of your personal injury settlement. If your personal injury settlement is considered a separate asset not subject to division, this may affect your liability for alimony and/or child support. If you're thinking about filing for divorce or are in the middle of a divorce, it's important to retain the services of both a divorce attorney and a personal injury attorney. These are two separate areas of the law that require specific knowledge and skills to handle effectively. Even the most experienced divorce lawyer is unlikely to have the ability to effectively represent you in a personal injury claim. It's also important to be honest with your personal injury attorney about the change in your marital status. You don't need to provide a detailed account of your marital troubles, but knowing about the pending divorce or the possibility of a separation helps your attorney represent your interests effectively. Confidentiality rules help protect the privacy of your personal information. What reports are helpful to build a strong car accident case?